Includes: Banner stand and base. Kit Includes: SLOPE Brandcusi Angled Tension Fabric Banner Stand, Graphic, and Carry bag. Kit Includes: BOW Brandcusi Curved Tension Fabric Banner Stand, Graphic, and Carry bag. Kit Includes: PLATEAU Brandcusi Straight Tension Fabric Banner Stand, Graphic, and Carry bag. 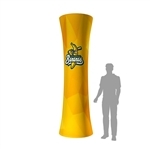 Includes: Heavy Duty Banner stand. Graphic not included. 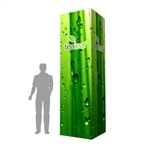 Kit Includes: Fountain table top banner stand, Graphic, and Carry bag. Includes: Stand, and sturdy carry case. Includes: Stand, and sturdy carry bag. Includes: Original Tabletop banner stand, and carry bag. *Graphic not included. Includes: Banner stand. Graphic not included. Includes: Traveler Banner stand, and carry bag. Graphic not included. Includes: Banner stand, graphic, carry bag. Trade show banner stands offer quick visuals and attract attention. If you need help finding the right banner stand solution, please contact us via phone at 1-888-323-6995 or via email at sales@monsterdisplays.com. We'll be happy to help you!